Preamplifier NE5532 board. - Rin----R, Right Channel Input. - Lin----L, Left Channel Input. - Rout----R, Right Channel Output. - Lout----L, Left Channel Output. Improve your audio quality. - GND----Ground, Battery Negative. Circuit Architecture: LM3886 OP07 NE5534. 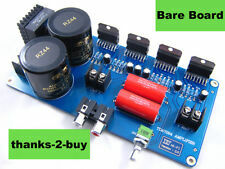 1pcs New LM3886 Stereo Power Amplifier Board Kit. Protection Characteristics: Overheating protection, DC Safeguard, Short circuit protection. Sound Channel: 2 Channel stereo. For sale is a set of compact, easy to build bare PCBs for an LM3886 based stereo audio power amplifier. Low distortion : advanced signal routing enables superior performance. Amplifier PCB (two boards included, one per channel). The board uses four TDA7294 to form a two-channel BTL circuit. When the AC is dual 25V, the maximum rated output power can reach 120Wx2 when the load is 8 ohms. This link is a PCB (empty board), does not contain any components on the board, the main picture is installed with a picture of the component for reference during production. It is PCB bare board and doesn't have any parts. Filter capacitor: 35V 4700uF / 35V 2200uF. The seat is a 5.08mm pitch. Due to the difference between different monitors, the picture may not reflect the actual color of the item. PCB for Leach amplifier, with output transistors in TO3 case, connected to PCB via wires. 1 x DA47 Amplifier Kit. This is DIY Kit, you need to solder it by yourself ! One pair CLONE PASS F5 TURBO Amplifier bare PCB. The price is for 2 channel Bare PCB. PCB size: 302 36. Copper Thickness: 35U. This is a blank PCB to build "The Mighty Midget", a single-ended stereo tube amplifier. "The Mighty Midget" is a simple, easy-to-build tube amplifier. It is designed for beginners, and puts out about 3 watts. This is blank PCB used to build a power-on delay circuit for a tube amp. These hazards can result in health problems, injury, or death. This is a blank PCB to build the "Engineer's Amplifier", a push-pull stereo tube power amplifier. It's easy to build - all the components mount on the PCB - and it sounds GREAT! PCB only, no parts or anything else is included. This is a blank PCB to build a 50 watt monoblock version of "Engineer's Amplifier", a push-pull stereo tube power amplifier. It's easy to build - all the components mount on the PCB - and it sounds GREAT! This is a blank PCB to build a 50 watt monoblock version of "Engineer's Amplifier", a push-pull stereo tube power amplifier. Version 2, without power tube sockets! Use whatever power tube you want - the socket mounts to the chassis and you connect it to the PCB with wires. For sale is a set of compact, easy to build PCBs for an LM3886 based stereo audio power amplifier. Just a set of 4 bare, unpopulated boards; parts are not included. Amplifier PCB (two boards included, one per channel). Product Model:LM3886TF. 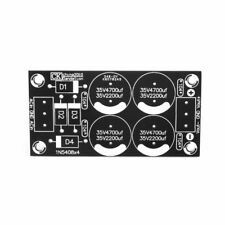 1PCS x Digital Amplifier Bare Board. Mono Power Amplifier Module. Can monolithic or used in parallel. Blue board using double-sided circuit boards, wiring reasonable, very nice amp. 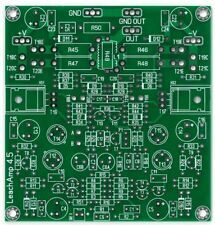 My design bare PCB using the LM4780 PA. • Main power and small signal star grounds. 1 x Bare PCB. Note: this item is only one bare board, not contain other parts. DC output interface wiring AC input connector wiring -Vout: Negative electrical outlet. 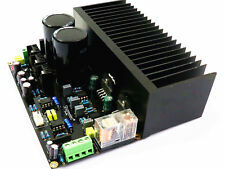 LM3886 dual channel power amplifier with protection and front amplifier 2 power amplifier board, 60 watts per channel. 1 x DA47 Amplifier Kit. New Billet Aluminum Low Profile Napa 4003 Wix 24003 Fuel Filter 1/2-28" 1/2" UE. 14mm 18mm Male Female Glass Adapter Joint Slide Bowl Extension various size UE. 2Pin 18 20 22 24 26AWG Black Red Cable Extension Wire 3528 5050 5630 LED UE. This is the PCB of a stereo power amplifier using NS's renowned LM3886 power amplifier chip. Either the circuit can be fed by 35Vx2ac which can be supplied to both the LM3886 power amplifier and the 6N11 tube, or for higher performance a separate 65Vac be fed to the tube. Output Power: 4x41W. Model Number:TDA7388. 1x Bare Board. Material: PCB board electronic components. Speaker: The 2P pin is a speaker interface, and the speaker is a non-polar component, so the speaker will not burn out if you pick it up. Appearance color: as shown.